Burmite was unavailable for many years due to the political situation in Burma (Myanmar) where it is only found. It is now being mined again, by a Canadian company which mines it under license. It is still extracted in the Hukawng Valley in northern Kachin State, but whereas it used to be mined by digging deep shafts in the valley floor, it is now extracted from the surrounding hills. Here only about 1 ½ meters of overburden need to be removed before the amber is revealed. Once thought to be about the same age as Mexican amber, it was recently realized that burmite is much older, at least 100 million years old, which means that it is Cretaceous. Other ambers that are used for jewelry or carvings are much younger, from the Tertiary period. Although large pieces have occasionally been found, burmite usually occurs in small pieces. Most of it varies in color from sherry to burnt orange, but a small amount is the glorious clear cherry red for which it is famed, and which was so popular with the Chinese for carving. Burmite is very clear, but most of the material displays swirls of color, which, under magnification, prove to be made up of minute dots of color. Much of the material is fractured, and some of the fractures are filled with calcite. Burmite is also unusual in that it can appear to change color according to the direction of light transmitted through it. A piece containing dark and light areas may look pale from one angle, whilst if lit from another angle, seems to be cherry red. This effect is probably caused by the light reflecting off the particles of color in the darker areas. Apart from its wonderful colors, burmite has a great variety of insect inclusions. Possibly because of its age, burmite is harder than other ambers, and it takes a very high polish. I believe that it fluoresces in sunlight, but, because of the present weather conditions in London, I have not been able to test this since taking delivery of a packet of the material. Polished surfaces do appear to fluoresce slightly even on rainy days. 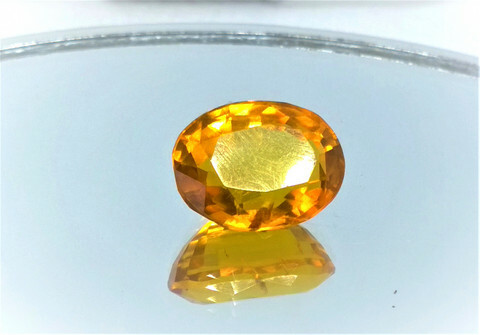 However, under a UV lamp, broken or polished surfaces display a strong fluorescence in an almost mid-blue color - much darker than, for example, Baltic amber.